Senior official tells Congress 5,000 refugees already resettled in US; target of 10,000 by end of 2016 likely to be met. 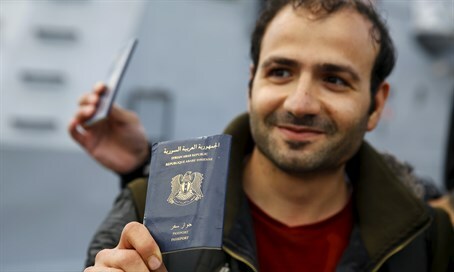 The United States has ramped up refugee processing and is now likely to meet the administration's goal of resettling 10,000 Syrian refugees by October 1, a senior official told Congress Thursday. Citing the humanitarian crisis triggered by Syria's brutal civil war, President Barack Obama had called for a dramatic increase in the number of Syrian refugees resettled in America in fiscal year 2016. But bureaucratic red tape, terror fears, concerns about inadequate security checks and congressional efforts to block refugee flows had left the process far behind in meeting the president's goal. Homeland Security Secretary Jeh Johnson however said Washington had "added security checks to the process where they are warranted" and overcome early hurdles. The United States has "just about crossed the 5,000 mark" in terms of Syrian refugees, he told a Senate Judiciary Committee hearing. He said 5,000 to 6,000 more have been "conditionally approved" for US resettlement, subject to security checks. "So I believe we will make the 10,000," Johnson said. After last year's terror attacks in Paris, critics including presumptive Republican presidential nominee Donald Trump have warned that the Islamic State was seeking to infiltrate the United States through poorly monitored refugee flows. Earlier this month in congressional testimony, CIA director John Brennan warned that the extremist group "is probably exploring a variety of means" to get operatives into the West, "including in refugee flows, smuggling routes, and legitimate methods of travel." Trump has seized on the issue, demanding an immediate end to US refugee admissions from Middle Eastern nations until a better vetting system is established. "Our country has enough difficulty right now without letting the Syrians pour in," Trump said in a National Border Patrol Council podcast earlier this month. "They could be ISIS. They could be who knows. But we're going to stop that immediately." Democratic White House hopeful Hillary Clinton said last year that Washington should expand the Syrian resettlement program to 65,000 refugees. Trump has warned voters that Clinton planned to spend hundreds of billions of dollars to resettle Middle Eastern refugees in the United States, or enough money to "rebuild every inner city in America," he said last week in a New York speech. Fact-checking website PolitiFact rated the claim "pants on fire" false.